Any organization needs a strategy. Any strategy needs to be properly described and monitored with KPIs. What is Balanced Scorecard Software? 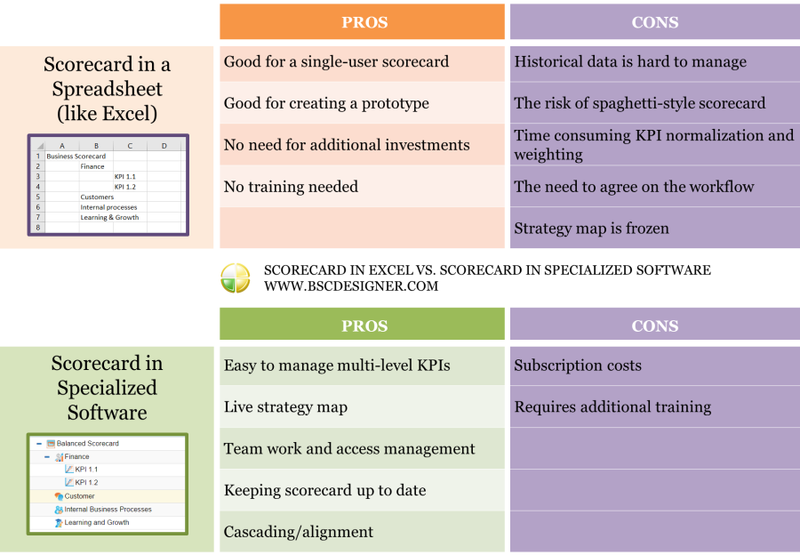 Balanced Scorecard strategy map with four perspectives in BSC Designer. Strategy maps with business goals mapped in four perspectives. Leading and lagging KPIs, metric normalization and scorecard calculation. Initiatives and action plans that include detail for goal execution. BI dashboards for data visualization and performance charts. Notifications to keep team members informed and accountable. Performance reports with important action plans, KPIs data, and charts. Spreadsheet vs. Specialized Scorecard Software. Video reviews of Balanced Scorecard Tools. $ 39.95 / month if billed annually. 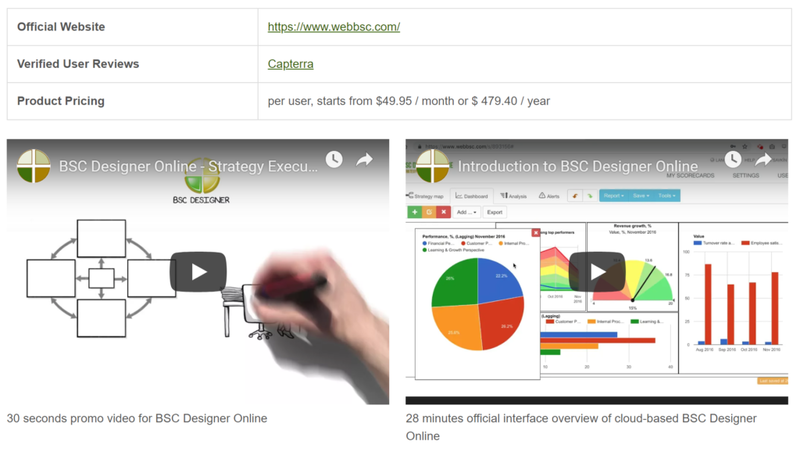 We find BSC Designer a very ergonomic and intuitive tool. It quickly adapts to your way to carry out the information analysis. It is simple, fast and effective. This tool has contributed a lot as a strategic planning and operation management solution that enabled everyone to track results at real-time and achieve assigned goals. We have a very good experience with BSC Designer, as this instrument can facilitate the implementation of the Balanced Scorecard in our unit. We use BSC Designer for measuring performance rather than effort. I was looking for a software for strategical planning for the company where I work, therefore we are looking for a way to implement the Balanced Scorecard. A great and practical option to deliver and keep a Balanced Scorecard. We share the best ideas about strategy execution and KPI challenges in the articles section. Need something more tangible? Check out the “Examples” section. Review the sections of this page once again. The BSC Designer team will be happy to assist you.